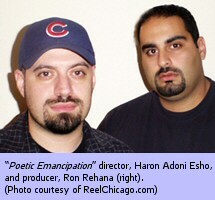 Producer/DP Ron Rehana and director Haron Adoni Esho have set themselves a tall order for their debut feature "Poetic Emancipation." Esho is shooting the mixed English - and Assyrian - language film on 24P DV throughout August. Writer Yalda Esha stars as an isolated young poet who begins to connect with the world through a homeless poet played by Spiro Zafiropoulos. Reach Rehana at rrehana@mac.com or Esho at campacinema@comcast.net.